Nothing says the holidays quite like the fragrance of a freshly cut holiday tree. With more than sixteen varieties available across five categories (i.e., fir, pine, spruce, cypress, and cedar), narrowing down your options may prove challenging, but you are rewarded with vibrant colors and pleasing aromas. Real trees are also better for the environment. Here is some information on four of the most popular holiday tree types to help make your buying decision a little easier. The holiday tree has been the focal point of holiday décor and family traditions since the 16th century. Legend has it that, after walking towards home one winter evening, Martin Luther was so awed by the brilliance of stars shining through the evergreens that he replicated the look by decorating a holiday tree with lighted candles. Clearly, not the wisest, nor safest way to decorate a real tree. Today, holiday trees are adorned with ornaments, twinkling light sets and garland for a safe, yet stunning look. People can, and do, use a multitude of colors or themes when trimming their trees. Have a favorite sports team? Enjoy a more rustic look? The only limit is your imagination. It is important, though, to be “fire smart.” This is true whether you’re erecting a real or artificial tree. The Balsam fir is considered one of the oldest holiday trees, dating back 250 years ago that is well-known for its conical shape and dense, dark green color. A medium-sized tree, which only reaches 1 to 1 ½ feet in diameter, the Balsam fir is ideal for small living spaces. Its name is derived from the many resinous blisters found on the bark. Lower branches feature a double row of needles, whereas, older branches (those near its crown) tend to have shorter needles that turn upward. This lends to the branches’ strength and longevity. Branches are strong enough to hold heavy ornaments. The Balsam firm not only looks good, but is extremely aromatic, too. Grown along the mountainous and coastal regions of California, Oregon and Washington, the Noble fir is rapidly gaining popularity with residents in the Pacific Northwest. It accounts for 25 to 30 percent of sales there. This species is known for its beautiful symmetry and strong fragrance. The Noble fir has inch-long silvery blue green needles which turn upward, exposing strong, lower branches. Stiff branches throughout make it an ideal tree if you have a lot of heavier ornaments. The Noble fir also provides excellent greenery for wreaths and garland. The best part is that it doesn’t dry out as fast as other species. The most used holiday tree, according to the NCTA, is the Douglas fir. A popular species, the Douglas fir is shipped across the U.S., as well as to Guam and some Asian markets. The tree has soft dark green or blue green needles that radiate in all directions from the branch which, when crushed, emit a sweet fragrance. The Colorado Blue Spruce, or simply Blue Spruce, is you guessed it … the Colorado State tree. Characteristics include sharp needles, which are often used for stuffing pine-pillows, a blueish-gray color and good symmetry. It also has good needle retention. Tip: Don’t crush the needles – they unfortunately emit a bad odor. Something to keep in mind for next year is that the U.S. Department of Agriculture Forest Service sells a total of 600 permits beginning in October (they are sold out for 2018). Permits allow Arizona families to trudge into the wilderness to pick the perfect holiday tree. Available types through this program include mixed fir and ponderosa pine trees. If you looking to start a new yearly tradition with your family, more information can be obtained on the government site at, fs.usda.gov. For additional varieties, lots in your area and tips on how to care for your trees, visit the National Christmas Tree Association (NCTA). Once the holidays are over, find a drop-off area in your city for any real greenery, including the holiday tree and wreaths. The City of Phoenix also hosts an annual event – “I Recycle Phoenix” – where residents can drop off their trees to be recycled. Recycled trees are then used as mulch in community parks and other open areas. 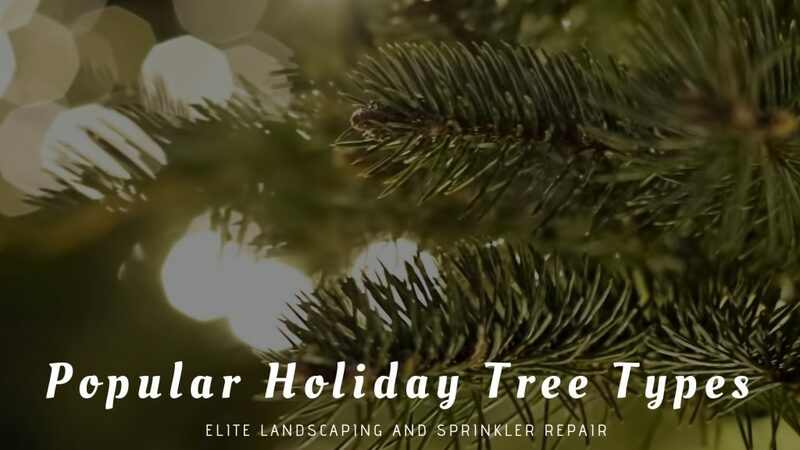 Elite Landscaping and Sprinkler Repair would like to wish you a very Happy Holiday season and a joyous New Year! We have been servicing residential and commercial clients throughout the greater metro area since 1982. Our mission is to provide professional and attentive landscaping design, installation, maintenance, and repair. Also, if you purchased a living holiday tree, we can plant it for you.